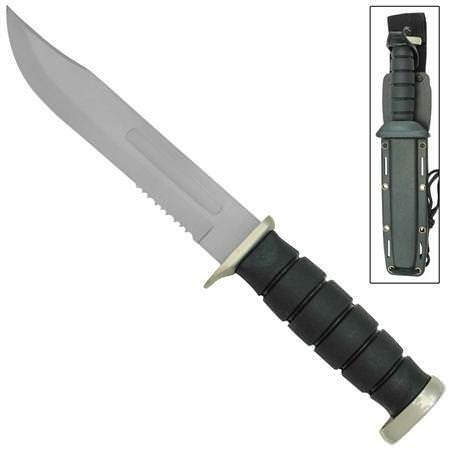 The Insurgent Fixed Blade Hunting Outdoor Knife is constructed of stainless steel with a clip point blade. The blade has a stain finish and is half serrated with a fuller running about half the length of the blade. The rubber handle offers rugged tactical design with rims around the handle, a short guard, and a steel pommel. 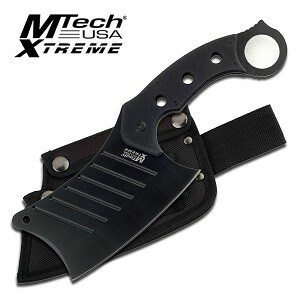 Included is a tactical sheath made of an ABS material with slits and eyelets running down the side to either strap it on or tie it on with the nylon cording provided. A hard sheath belt loop and nylon belt loop is provided to wear your knife on your side or snap it on your pack. The nylon belt loop has Velcro around the snap for added security. A rubber closure fits over the pommel to keep the knife snug and secure in its sheath.